Mark David Loretta was born on August 14, 1971 in Santa Monica, California. The six foot infielder was drafted by the Milwaukee Brewers in the 7th round of the 1993 draft. After making the American Association All Star team in 1995 he got a promotion to the Brewers squad as a September call up. He earned a reputation as a good contact hitter and one of the toughest guys to get out with two strikes. He usually wore the uniform number 8 most of his career, until his final years. He would spend seven and a half seasons in Milwaukee, batting over .285 four times. In 1998 he batted .316 with a .382 on base percentage, striking out only 47 times in 434 at bats. 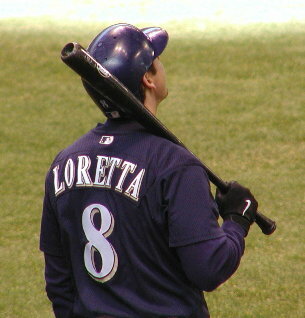 Loretta would bat .291 the next season and hit over .280 twice more before going to the Houston Astros for the 2002 stretch run. He would play all infield positions in his career, posting fielding percentages at the top of the league at both second base & shortstop. In 2000 he posted the best fielding percentage by all NL shortstops at .995. In 2001 in an 11-3 loss to the Cincinnati Reds, he volunteered to pitch in order to help out manager Davey Lopes depleted bullpen. Loretta made his pitching debut, throwing one inning allowing one hit, one walk & striking out two batters. 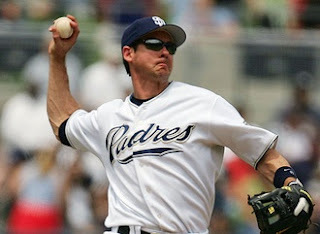 He signed on with the San Diego Padres for three seasons as a free agent in 2003, going on to have his best seasons. He hit .314 (10th in the league) with 13 HRs & 72 RBIs his first season in Southern California. He had an even better year in 2004, with career highs in batting .335 (third in the league) doubles (47) (fourth in the league) hits (208) HRs (16) RBIs (76) and on base percentage (.391). He became only the second Padre in history to gather over 200 hits in a season, the other was Tony Gwynn. Defensively he led all second basemen in assists (451) & was second in putouts (288) posting a .987 fielding percentage, making his first All Star team. In 2005 he got to his first post season going 4-15 (.267) driving in two runs against the St. Louis Cardinals in the NLDS. In the winter of 2005 he was traded to the Boston Red Sox for another Italian American ball player, Doug Mirabelli. He hit his first career walk off HR that April, & made another All Star team batting a solid .285 in 155 games played. He returned to Houston for two seasons signing on as a free agent to play a utility role. 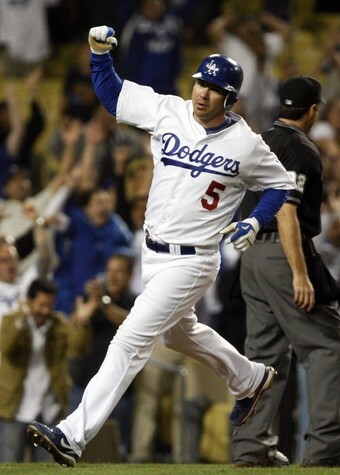 There he had another walk off HR in June of 2007 against the Rockies. He batted over .280 both seasons, continuing to play a consistent infield. In 2009 he signed a one year deal with the Dodgers in his home town Los Angeles area. He finished his career there batting only .232 but made another postseason, and went out with the biggest thrill of his career. Post Season: In Game #2 of the NLDS he pinch hit in the bottom of the 9th inning with the bases loaded & the score tied against St. Louis’ Ryan Franklin. Loretta singled to centerfield driving in the games winning run, putting L.A. up two games to none on their way to a sweep. Loretta finished a 15 year career with a .295 average, 1713 hits 76 HRs 309 doubles 22 triples and a .360 on base percentage, striking out 605 times in 5812 at bats. He has the 10th best all time fielding percentage for second baseman at .991.